Filar cysts (FCs) are detected incidentally on ultrasonography (US) of the neonatal spine. Their clinical significance has not been widely discussed in the literature because FCs are usually asymptomatic. This study aimed to investigate the clinical features of FCs and distinguish FCs that warrant attention. We retrospectively analyzed 396 patients with lumbosacral skin stigmata. Patients who were younger than 1 month old at reference underwent US initially, and those older than 1 month of age underwent magnetic resonance imaging (MRI) at the age of 5–12 months. Patients with an FC in the US underwent subsequent MRI at the age of 5–12 months. Patients with an FC were followed clinically for at least 3 years. FCs were identified in 56 (14.1%) patients. Of the 195 children who underwent US initially, FCs were detected in 49 (25.1%) children. FCs were detected in seven children who underwent MRI initially. 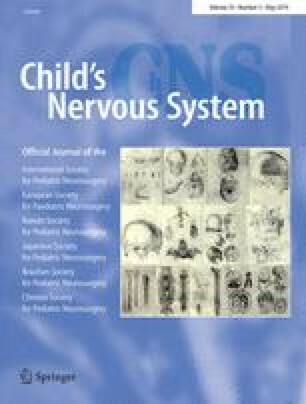 Of the 50 children with FCs who underwent MRI at the age of 5–12 months, FCs in 20 patients (40%) showed natural regression and FCs in 30 patients (60%) remained. Two of these 30 patients showed progression in size of the FC, and in both cases, the FCs were associated with a filar lipoma; however, the resected cysts were not neoplastic and did not have obvious clinical significance. Our study characterizes clinical features of filar cysts. Two-thirds of FCs remained in late infancy. The best sequence of MRI to follow-up FCs is heavily T2-weighted images. We thank Lesley McCollum, PhD, from Edanz Group (www.edanzediting.com/ac) for editing a draft of this manuscript. This study was approved by the Office of Research Integrity Review Board of Jichi Medical University.